Classes fill up quite quickly, please leave a deposit to hold your spot. Balance will be due at the first class. 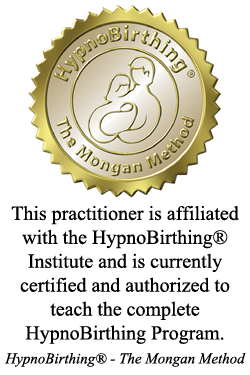 HypnoBirthing(R) is a powerful method designed to help you relax and trust the birth process. It is as much a philosophy of birth as it is a technique. This amazing program teaches you, along with your birthing companion, the art and joy of experiencing birth in a more comfortable manner. You will learn to tune in and connect to your own natural birthing instincts...you will be aware and fully in control, just profoundly relaxed. HypnoBirthing(R) allows us to break the Fear-Tension-Pain Syndrome by working directly to release conscious and sub-conscious fears.